This past week I was in Chicago on a business trip doing my businesy things and meetings all day but as normal, I had root beer on my mind as soon as we were going back to the hotel and looking for dinner. Plus I’ve got that whole New Year’s resolution of 52 brews this year, since last year I fell a little behind, what with the move and all. My searching found the Brown Cow Ice Cream Parlor, which makes all manner of tasty desserts and has an old fashioned soda fountain with their homemade pops, including root beer. I’ve long wondered about how to categorize old fashioned soda fountain root beers. I’ve seen the fountains before but none I’d visited had their own root beer. Now that I had one sitting before me, I have decided to make it its own category of gourmet root beer. Old Fashioned Fountain Root Beers. Yup. If you don’t know, at an old fashioned soda fountain they put the syrup in the glass and then mix with the soda water, sometimes they mix the carbonating chemicals, like phosphate in separately. So here’s the first of what hopes to be many a fountain and phosphate reviews. The Body is minty and mild; sweet with some bitter hints to it. It’s also a rather generic flavor profile. 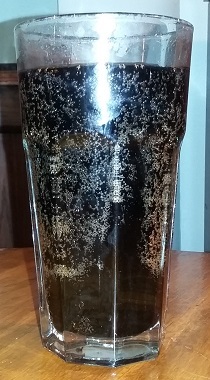 The Bite is a little spicy with decent carbonation, but there is no Head at all, despite my telling them to make a lot. The Aftertaste is wintergreen that ends on bitter notes. Not bad. It could be a little stronger and I really wish they could make a foamy Head on it. There’s no reason for it not to have one, just need to put a foaming agent in there. Though they focus more on their very elaborate root beer floats, so that may be why they purposely kept it not foamy. Well, It hurts them in the review, but I think they would probably have an amazing float, so if you’re out in the west side of Chicago, check this place out. The Brown Cow’s Soda Fountain. I wish I had gotten better pictures of the rest of the parlor.